WASHINGTON (CN) – Putting rumors of a first-day recusal to rest, Justice Neil Gorsuch remained quiet Monday as an attorney who championed for his confirmation addressed the bench. One of three arguments on the day’s docket, the case involves a challenge by the town of Chester, New York, to the standing of those who intervene in federal civil cases. A former acting U.S. solicitor general, Neal Katyal is now with the firm Hogan Lovells. He also wrote an editorial for The New York Times titled “Why Liberals Should Back Neil Gorsuch.” Katyal also introduced Gorsuch at his confirmation hearing just a week before this morning’s argument. Katyal told the court this morning that intervenors should be held to the same standing demands as plaintiffs to keep them from hijacking cases for their own interests. “If you don’t confine federal courts to their lane, as Article III does, and allow bystanders, sometimes ideological bystanders who don’t have Article III standing, you are imposing that they use the massive power of the federal [judiciary],” Katyal said. The U.S. government, which arguing as a friend of the court, proposed something of a compromise solution, saying that intervenors should not face an inquiry on their standing so long as they do nothing to alter the litigation they join. The proposal recommends that intervenors would have to prove standing once they try to make any changes by requesting discovery or making motions. With Justice Stephen Breyer leading the charge, the court seemed to back the government’s solution to the standing problem. Though more restrained in this case than he was in the first argument o the day, Gorsuch drew laughs from the courtroom when one of his questions led to the assistant to the solicitor general to admit that Chester had put forward at least one flawed argument in the case. 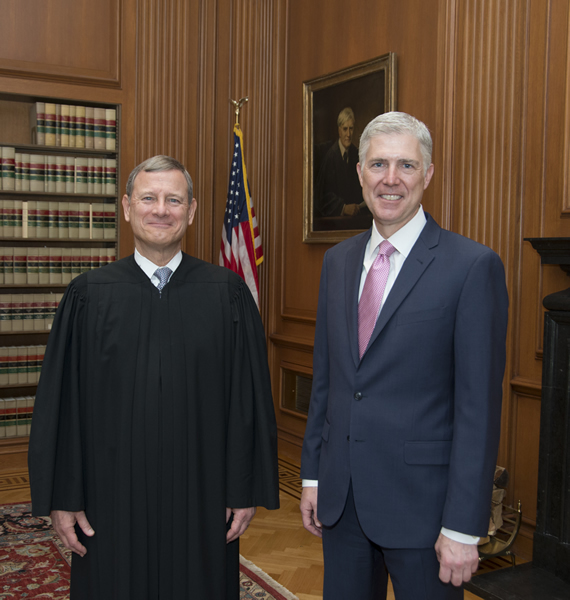 “I appreciate the candor of that concession,” Gorsuch said. The judge was also quick to speak up when he felt that he was not getting a direct answer to his questions. “I’ll let you go,” Gorsuch told Shay Dvoretzky, a Washington attorney with the firm Jones Day, after repeatedly pressing the attorney on a point. Gorsuch laughed and flashed a quick smile as Justice Sonia Sotomayor, sitting beside him on the far-right side of the bench, whispered something in his ear. Perry v. Merit Systems Protection Board, the first case before the justices Monday, concerns jurisdiction over certain types of federal employment lawsuits. Gorsuch showcased his brand of textualism from the first question he asked. Gorsuch apologized to Landau for “taking up so much time” as he wrapped up his questions.